Stealth Inc is a fast-paced stealth platformer featuring brutal hazards, ruthless enemies, fiendish puzzles and red pixels galore. Jump, sneak, and be chunked through 80 levels. Will you make it out alive? Armed with only your wits and a pair of top of the range Stealthing Goggles, it’s your job to sneak your way through a deadly facility that’s determined to extinguish your fragile little life. With no weapons and no armour, being seen means instant death. Pre-order to receive an exclusive PS3 theme. Unhappily ever after. That’s how it starts. The Orb resurfaces and the classic characters return. Kobbler with his mania, Princess with her endless boredom. It’s only a matter of time before Bob, our hero, shows up to put order back to madness. Three powers struggle for victory and the fate of Cloudberry Kingdom hangs in the balance. Pre-order to receive an exclusive PS3 theme. ibb & obb is a two player cooperative game set in a puzzle filled world where gravity goes both up and down. You can only succeed by working closely together. Find a friend for some true local cooperative couch fun or match up online. Pre-order to receive an exclusive PS3 theme. DuckTales: Remastered is a hand-crafted, beautiful reimagining of one of the most cherished 8-bit titles of all time. Go back to one of the golden ages of gaming, but now refined with a level of detail that will please the most hardened devoted Disney or retro Capcom fan, alike. Pre-order to receive an exclusive PS3 theme. The latest title in the DYNASTY WARRIORS series of tactical action games, set in the Three Kingdoms era of ancient China, takes everything that made the previous titles so popular, and adds new layers of excitement. Several new characters take the roster of playable characters to over 70. Shaun White Skateboarding, a game that puts an innovative twist on the action-sports genre, is the latest offering in the award-winning franchise developed in collaboration with dual-sport super-athlete, Shaun White. The most ambitious installment yet, Shaun White Skateboarding allows players to transform a dull, lifeless city into a vibrant and extraordinary skating playground- simply by skating. You’re about to marry Princess Toki, the girl of your dreams. But before you can finish your vows, your wedding is attacked and you’re mortally wounded! As you take your final breaths, you discover that your princess is actually two girls in one, and that they can travel through time. Now you must go back in time and find out who attacked you in order to save your own life! Turbo: Super Stunt Squad is a high-velocity action game featuring the super-charged crew from the film. Each playable character has their own signature street style and tricked-out skills which will come in handy when showing-off super-cool stunt moves. Expert skills will also prove useful to earn power-ups, customize your character, win competitive challenges and discover shortcuts in the dynamic larger-than-life environments of Turbo’s world. After losing contact with his explorer friend Virgi, our fearless alien hero Spidy heads to Earth in his spacecraft to find her. While entering the Earth’s atmosphere, his spacecraft suddenly fails and starts to break up, causing Spidy to crash-land on the strange planet. Spidy finds himself alone on an alien world and faces the epic challenge of tracking down Virgi, battling strange new enemies and finding the missing pieces from his spacecraft in order to repair the damage and make their escape home. Mamoru is in trouble! After a car accident, he wakes up in a mysterious land with strangers that he’s never met before! One of the strangers, Fururu, tells him that he’s arrived in the underworld and that she needs his help to fight off dark forces! One of the most impressive hidden-object adventure games ever made in a sumptuous high-definition edition! Help out James Voodoo as he investigates mysterious attacks through the forsaken hamlet of Ravenhill, the wealthy city of Richtown, and a variety of breathtaking sceneries inspired by major fiction genres: adventure, film noir, thriller, steam punk, and more! Life in the temple of rabbits hangs by a thread. Universal Evil has struck again and kidnapped all of your disciples. Only you managed to escape. They let you live… They’ll soon regret it! Use your agility and combat skills to save your disciples! Jump from roof to roof, slide gracefully along walls, sneak up on your enemies, and rip them to shreds! Geronimo Stilton is the editor-in-chief of the most widely read newspaper of New Mouse City: The Rodent’s Gazette. He is also a best-selling author and often travels around the world to find new experiences and fresh ideas for his books. Help Geronimo Stilton and his friend Scribblehopper overcome 62 brain-teasing puzzles, riddles and action-packed mini-games as they cross the Kingdom of Fantasy to save the Fairy Queen. Geronimo Stilton, editor-in-chief of The Rodent’s Gazette, never thought he’d return to the Kingdom of Fantasy. But when the Queen of the Fairies sent him a letter asking for his help, he had the strangest feeling that a brand new adventure was just about to begin. Download Geronimo Stilton Return to the Kingdom of Fantasy The Videogame – and get ready for a spectacular story you’ll never forget. Orphaned as a child, Lux was raised in the small village of Selka by his grandmother. He lived a quiet and uneventful life there until on his 18th birthday, when he decided to join the legendary Holos Guild, an organization whose primary mission is to rid the world of evil. And that’s when Lux’s life began to change. The VidZone application lets you manage your own personal library of music videos and exclusive content from thousands of top bands and solo artists. Search for your favorites, create your own music video playlists or choose from a selection of themed VidZone TV channels such as Hip Hop TV, Metal Mania TV and Country Hits TV. Our PSN Play promotion is back, and you can pre-order awesome upcoming titles including DuckTales: Remastered, Cloudberry Kingdom, ibb & obb and Stealth Inc: A Clone in the Dark. 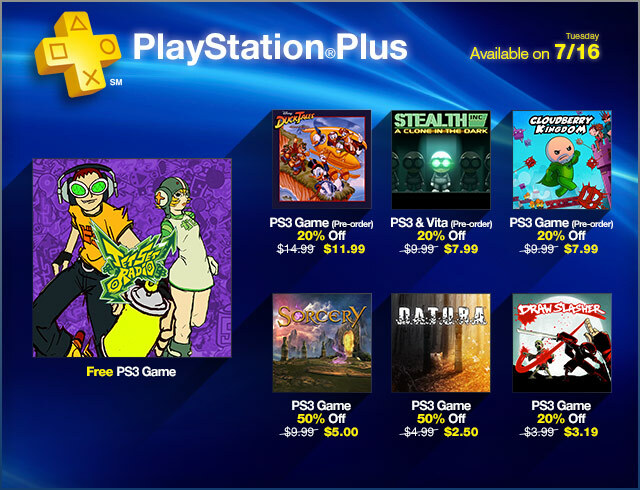 Best of all, if you’re a PS Plus member you’ll receive a deeper discount. In the meantime, there’s tons of new content available on the Store this week including Dead Island: GOTY Edition, Shaun White Skateboarding, Alien Spidy and R.I.P.D. The Game. Our portable platforms, PS Vita and PSP also have some new content like Doodle God and Geronimo Stilton in the Kingdom of Fantasy. WTH?! Why Mystic Chronicles isn’t compatible on vita? It should be coming in the near future for PS Vita, but the main version that was cleared for publish this week was only for PSP. We’ll update in a future PS Store update post when it’s all set for Vita. Also, just dug in on this and Mystic Chronicles will be available to download on the August 6th PS Store Update. Thanks very much for your patience on this, and we apologize for any inconvenience. Lastly, if you are going to downloaded it before 8/6, you will need to download it again after the 8/6 Update to play it on PS Vita. Nice sales but nothing for me this week. Really yet again now motorstorm Arctic edge for play on the vita! Why after the first bunch has this all stopped? I think he meant to say that it’s on track to releasing, but not neccessarily this week. Regardless, we’ll always update with the latest PS one Classics as they release; so just keep checking the Store Update posts every Tuesday to see if one of your favorites has arrived. Nice sales this week. Definitely picking up Datura and Sorcery. Maybe EDF 2017 as well if I can scrounge the cash. Isn’t this a Vita game? Can we get Valkyria Chronicles 2 some vita support? I want to buy it but I own a vita and last time I played it on the psp a while back it was pretty fun. @Morgan do I have to pre-order all four games today to get the special offer? Where’s Crash and Spyro for Vita? Awesome. we finally have Vidzone in the U.S. There are quite a few apps to check out! Ya I spent $15 on Mystic Chronicles because everywhere online, even at E3, said it was Vita compatible. Don’t buy it unless you have a PSP. I WILL NOT ASK YOU AGAIN. ADD METAL GEAR SOLID(PS1 CLASSIC) TO VITA’S PS STORE. AND DON’T FORGET PORTABLE OPS AS WELL. VITA USERS IN EUROPE AND RUSSIA HAVE THEM IN THEIR PS STORES. AND WE. DO. NOT! THIS IS UNACCEPTABLE!!! FIX IT. OTHERWISE YOU’LL LEAVE ME NO CHOICE BUT TO STORM EVERY UPDATE WITH THIS REQUEST. PLEASE! More free Soul Sacrifice DLC? This is just too generous, thanks. Also, will check out the new dynamic themes. I like the summer slow period, as it allows me to work on my huge backlog of PS3 and Vita games. Can you add Metal Gear Solid Portable Ops (PSP) to the PS Vita store please? why do u guys charge so much for digital games? amazon ,gamestop,walmart,target ,bestbuy have way better prices for new games and the used game sales really make digital games look like they cost a $100 bucks a pop. Off subject about the update, but on subject about the store. People have avatars from the game named Generation of Chaos: Pandora’s Reflection (The blonde girl and such) Where are people getting these from on the US PSN Store? here is a simple way to make money. Hi have a complaint on the doa 5 released today. I bought the paradise pack when it was there for a limited time on the vita and got the cheerleader pack free from GameStop pre order. When I went to get the ps3 version if it it’s shows I have to buy it again. I bought already and it’s showing me this. Can I get any assist on this matter? Thanks. Awesome update today! Already picked up Mamorukun Curse! and pre-ordered all 4 of the Play 2013 games. Duck Tales HD at a discount alone rocks but knowing that I can grab those 3 other games and get $10 back is a no-brainer. Plus, supporting indie devs is something we ALL need to be doing! What happened with TR update? Hate you guys. What happened to mystic chronicles being playable on the vita? According to Natsume’s press release and message board it supposed to be for both systems. what happened? Apologies for the delay on this. As mentioned above, the game will be downloadable on PS Vita on the 8/6 update. We’ve reached out to our friends at Natsume to ensure that they can share this information with their community as well, but we apologize for the inconvenience on this. No Dynasty Warriors 8 costume DLC or avatars? I NEED ALL THE DLC AND AVATARS!!! Referring to #4’s avatar also from Generation of Chaos: Pandora’s Reflection. People on US store have the avatars but I can’t find them on PSN store… Where are you guys finding them? Will the version of Mystic Chronicles I bought work on Vita when the Vita version is released? You will need to download it again after the 8/6 update to get the new version that works on PS Vita. Thank you for releasing the Soul Sacrifice DLC. But, do you still not know why Europe got it a week earlier? Not that I’m complaining or anything; I’m satisfied, even. You should take a page out of Steam Summer sale’s book. New AAA games at ridiculous low prices. The only games that were lower than 10 bucks on PSN were at least 2 years old. Thanks for the feedback on this not; and hop on Mass Effect! Should be a blast to experience if it’s your first time. @31, Cortez, why not send a friend request to her and ask her how she got her avatar. ArchAngelMai seems like a nice person from all her other posts so I’m sure she’d help. Where is that PSOne classic that you guys were teasing??? Pre-ordered DuckTales Remastered. There’s a cool theme in it, and my inner child is excited. How long do we have to pre order before it [The Pre Order] goes away? A week before the game releases? I assume the sale is for the Beat Hazard Ultra game and not a trial version of it. OMG Doodle God but please make it free like Jetpack Joyride or cheaper. No “Exploding Meat” in the Dead Island GOTYE? I already have it, but what if no one played Home at that time to get the add-on? Can I complain to Consumer Affairs for false advertising? One of you guys said there is a certain PS One classic coming this week and it’s not here.